I recently had occasion to visit Manhattan via the Staten Island ferry, which almost makes up for the normative Jerseyan gateway to the city. 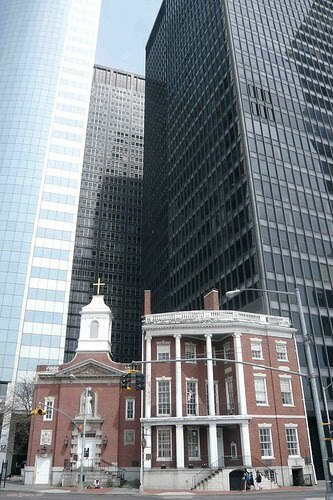 The church that greets the visitor is the Mother Ann Seton shrine (left), sandwiched between skyscrapers, holding on for dear life. Entering the nearby Castle Clinton monument, photographs of the expanding New York skyline show an age when steeples once dominated, until they were displaced by monuments to capital. The tale of churches trying to keep up, be it through skytop chapels or Gothic skyscrapers, is well narrated by Van Leeuwen's The Skyward Trend of Thought, and has since been complemented by two new books on the Woolworth Building and the Trib Tower that I'm dying to get my hands on. But ultimately, of course, the battle for ecclesial prominence was lost. Or was it? As I left Manhattan, I looked across the water to the Brooklyn badlands in the distance, and saw a strange thing: A nearly exact picture of New York of old. In most North American towns today, it is easily forgotten, steeples still dominate the skyline.